March 27, 2019 in News: Meeting vzw GOEVIE! On 15th of May 2018 we held the sixth workshop with students from “St. Paisii Hilendarski” Secondary school. In the group we invited children from other nationalities – Turkish and Iraqi in order to get these children closer to their peers. Mrs. Grudeva presented the project, introducing the goals and the expected results to the participants. 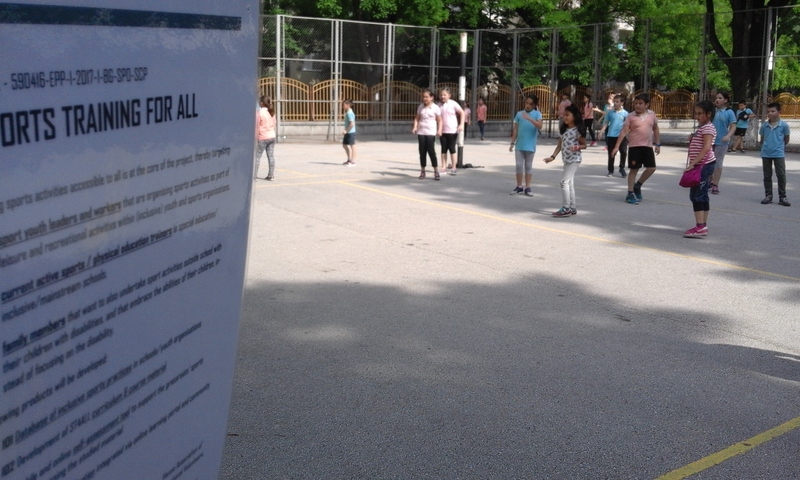 The workshop started with a warm-up and preparatory exercises for Dodgeball. From the beginning, we noticed how happy these children were to jump, run, and do exercises for general development. These children obviously felt equal to the other participants. When we started playing Dodgeball, these children were timidly staying at the end of the playground and were afraid to catch the ball. We asked the participants after they caught the ball to pass it over in order to teach them how to throw and aim. We explained that they all played for the honor of the team and the more they could do, the better. After several similar tryouts, these children became more confident and soon they understood the rules of the game. In this way, the boys and the girls from the other nationalities felt more respectable, found their place in the team, which also helped them in the other cooperative, interactive activities. The workshop lasted 45 minutes. At the announcement of the end of the game, the girl of Iraqi origin said, “I want to play again.” We promised that there would be more meetings. The meeting was organized by Mrs. Nina Grudeva and Mrs. Silva Ikimova as the sixth workshop within the project aiming to raise pupils’ awareness about the benefits of practicing various sports.